The Chicago Cubs will keep Mike Quade as their manager, choosing to go with the man who ran the team well for the last six weeks of last season rather than a higher-profile name. Quade, the team's third base coach the past four years, was given a two-year contract Tuesday along with a club option for 2013. He served as interim manager after Lou Piniella abruptly stepped down in late August, leading the team to a 24-13 record. The job will be his first as a major league manager. The hire is the first under new owner Tom Ricketts, who watched the Cubs finish out of the playoffs yet again. Chicago's infamous World Series championship drought now stands at 102 years. The Cubs finished the season at 75-87, in next-to-last place in the NL Central and a far cry from what a team with a payroll of about $145 million to start the season had expected. Saying he needed to be with his ailing mother back in Florida, Piniella stepped down Aug. 22 after the Cubs went into a 5-20 skid that left them at 51-74. He was in the final year of his deal and had put together three straight winning seasons, but could not get the Cubs out of their funk. There was speculation that general manager Jim Hendry might hire Cubs Hall of Famer Ryne Sandberg, the manager at Triple-A Iowa, or a former major league manager like Eric Wedge or Bob Melvin. The Cubs were also reportedly interested in the New York Yankees' Joe Girardi. Instead, Chicago went with the 53-year-old Quade, who managed more than 2,300 minor league games in the Montreal, Philadelphia, Oakland and Cubs farm systems before arriving in Chicago. The Chicago-area native was originally selected by the Pirates in the 22nd round of the 1979 draft out of the University of New Orleans and spent four seasons as an outfielder in Pittsburgh's minor league system before entering the coaching ranks. He received his first managerial position in 1985, with Class A Macon. He was promoted to Piniella's staff after a running the Iowa Cubs from 2003-06, a stint that included two first-place finishes in his four seasons. 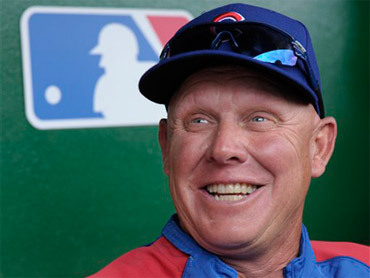 He finally got his chance to manage a big league team after Piniella retired, when the Cubs decided to go with Quade over Sandberg and bench coach Alan Trammell. The audition went well. Players responded to Quade, and over the final 37 games, only the Philadelphia Phillies posted a better record. The Cubs got a lift from promising rookies such as shortstop Starlin Castro, who hit .300, and outfielder Tyler Colvin. He hit 20 homers before he got struck in the chest by a broken bat in late September, ending his season. Young pitchers Andrew Cashner and Casey Coleman showed promise, but the Cubs basically dropped out of contention right after the season started. Derrek Lee and Aramis Ramirez, who was bothered by injuries, got off to slow starts. Lee, Ryan Theriot and Ted Lilly, who played big roles in winning division championships in 2007 and 2008, got traded. Ramirez wound up hitting .241 with 25 homers and 83 RBIs. Alfonso Soriano struggled, finishing with 24 homers while batting .258, and Kosuke Fukudome hit .263. Carlos Zambrano got sent to the bullpen in a surprise move early in the season and the volatile pitcher had another meltdown in June after returning to the rotation. He had to be separated from Lee in the dugout after giving up four runs in the first inning of a game against the White Sox and got suspended and sent to anger-management counseling. When he was reinstated, he looked more like the ace of old, going 8-0 in his final 11 starts to finish 11-6.